"I lost my independence, my freedom," the boy said. Police in Bridgeport are looking for the thieves who stole a wheelchair ramp from the home of a 10-year-old boy who cannot get to school in his wheelchair without it. "I lost my independence, my freedom," Isaiah McLaughlin said. 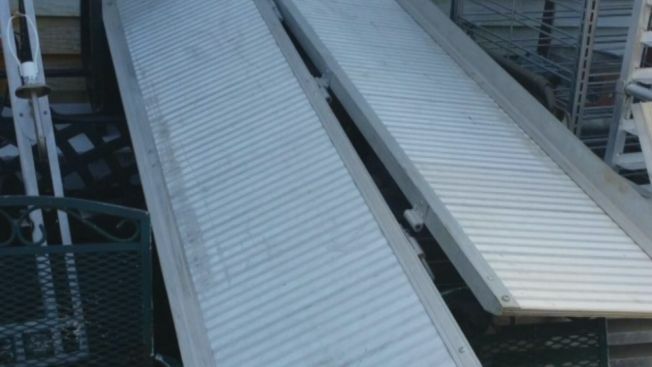 The family has had the ramp for five years, but it was stolen on the Saturday before Easter. Isaiah’s mother, Gloria Ramirez, said she went to work that Saturday and it was gone when she came home. “Whoever it was really needed it, because who would do that on a holy weekend?" Ramirez asked. Ramirez searched around her block, but has not been able to find it. Isaiah, who has a rare congenital joint condition called arthrogryposis, was forced to stay home for days because he had no way to get his 450-pound mechanical wheelchair to school. That changed when a security employee at Isaiah's school decided something had to be done. Kelly Mason called a tow truck driver to get the wheelchair to school and reached out to a local motorcycle club to volunteer the manpower to build a new chair. “When I saw Isaiah, he just didn't look like himself. He's usually happy go lucky and cheerful. He brightens up everybody's day," Mason said. "You know what it was? A blessing, because it showed me how the building I work in came together as a school," Mason said. The ramp is still missing. Ramirez wants to know who stole the ramp, but she is not letting it dampen her spirits. "I just keep smiling because of this little guy," she said of her son. Police are investigating, and the family believes the thieves stole the ramp to sell as scrap metal. If you'd like to help, you can make a donation on the GoFundMe page set up for the wheelchair ramp fund.